Sorry, looks like just another FPS. I’m really tired of these. Destiny, the world’s most expensive video game, cost £300 million to make | Mail Online. Give me a good space sim game that I can use with my Saitek HOTAS stick and throttle and you will get my money. Let’s reboot the Wing Commander or Freespace franchises. Even better, how about modernizing Independence War. It had the best flight and combat system of them all. Full Newtonian physics! Give us that, and 000hhhhhhh! make it multiplayer. AWESOME! Wouldn’t mind seeing something new in the Mech Warrior world, either. Hmmm… Another Wii U hit piece by a supposed Nintendo fan? Ok… I’m really getting more than a little annoyed with the dumping on the Wii U. It’s the #2 next-gen console after PS/4 and has a significant lead over Xbox One. And let’s be honest… if Wii U is on life support, then by that standard XB1 was dead on arrival. When I look at the racks at the store, I see row upon row of Wii U games. Not to mention all the Wii games. Maybe 1/3 case of XB1 games and 1/2 case of PS/4 games. It honestly seems like there’s too many arm chair quarterbacks who have their collective knickers in a wad in *wanting* Wii U to fail. As far as people rushing to by ANY console… it’s just not going to happen. In this economy people are buying to replace an existing console, not simply to keep up with the newest toy. It’s not just Nintendo who’s sales are down. Look at the backpedaling Microsoft is doing to try and get people to buy. That argument is a straw man. So far, I’ve not regretted at all choosing Wii U over XB1 or even PS/4. The range of genres on it is by far the most complete. We can play Mario, the Lego games, or you choice of FPS like Call of Duty. No… Grand Theft Auto is not on it. I consider that a good thing. So what are you thoughts? Especially if you have a Wii U? Are you still glad you have the system? What games/features are your favorite? Ok, iPad users. Many of you know I have strongly supporting the DataViz product Documents To Go as the best office suite available for your device. They have recently updated to a version 5 release. From everything I’ve seen, you will loose a lot of capabilities. Cloud access is broken. If you have purchased the Premium upgrade, there are problems in restoring you Premium status. I’ve seen reports of numerous other problems. This is particularly disappointing because the products greatest strengths have been it’s compatibility with MS office. No other – not even QuickOffice – comes close and it’s ability to handle larger documents. I was really looking forward to seeing the improved presentation support. The most essential accessory for making the iPad a serious productivity device is undoubtedly a good keyboard. Apple did not even consider support for a keyboard initially and “pooh-poohed” the idea that anyone would want one. In spite of their original disdain for a keyboard, even Apple got on that bandwagon with both their Apple Wireless Keyboard and their Keyboard Dock for the iPad, though the latter is (understandably) discontinued. My History For this review, I’m going to assume that the reader already recognized the value of a keyboard with their iPad. Keyboards are something I have long been very picky about. I will probably write a full post on my history and preferences with keyboards, but let’s just leave it at I cannot afford to skimp on quality where keyboards or mice are concerned. Just so you have a reference for this article, my keyboard at home and work is the current version of the original Model M buckling spring mechanical keyboard. The Apple Wireless Keyboard is not an iPad specific keyboard, though Apple advertises it with the iPad accessories. It has been my primary work desk keyboard for my iPad for some time. For as small as it is, it has a surprisingly good action and is easy to type on. Moreover, it is a full-size keyboard which is good for my large hands. However, this keyboard doesn’t travel well. The power switch is an easily triggered button on the side. For some bad luck reason, when it gets turned on by accident in my bag, it seems the next key to get pressed is always the multimedia Play button. When I nearly wreck the car when the power chords from Bat Out of Hell came blaring out of my mini case, I realized it was time to find something more travel friendly. This led me to the Belkin iPad Keyboard. It was reasonably priced, full sized and had a physical switch on the bottom. The only downside of it was that it was not terribly durable. I took about one year of serious daily use to wear it out. Numerous letters either skip or go into auto-repeat. Far beyond the “double type” problem inherent in all Bluetooth keyboards. As a result, I was back in the keyboard market. There are a few things that I consider absolutely essential in an iPad keyboard. First, it has to be a full-sized key layout. I am a reasonable speed touch typist of about 60 wpm and the keyboard needs to let me at least be in the ballpark. Second, it has to be highly transportable. I prefer a keyboard small and light enough that I can put in my bag with my iPad when I need it and leave it behind when I don’t. Third and latest, it has to have a mechanical on/off switch that will not get triggered accidentally. No more surprise power chords. Other preferences that I would prefer are things like comfortable key travel, a good tactile response, indicator lights and a selection of iPad specific control keys. However, these are all subject to tradeoff to give the best typing experience. Those requirements immediately ruled out the most common type of iPad keyboard – the keyboard case. I honestly don’t understand why anyone other than a “hunt-and-peck” typist would ever want one of those. They are cramped and anything more than a short email becomes very uncomfortable rather quickly. It also ruled out a full size Bluetooth keyboard. Now I do have to clarify what I mean when I say “Full Size.” regarding the keyboard. By that I only mean that the QWERTY layout has to match that of a traditional keyboard in size and spacing. I am not referring to the physical size of the keyboard itself. I am also not referring to, or requiring, items like function keys or a numeric keypad. Obviously, these requirement very quickly ruled out much of the field. As I said earlier, the market is dominated by keyboard cases using miniaturized layouts. My choices ended up surprisingly to be what you would expect to see for a traditional desktop keyboard vendor: Apple, Logitech and Microsoft. The Apple keyboard is one I already have and as noted, it is an excellent keyboard. The power button issue I mentioned, however, makes it undesirable for easy transport. Microsoft has three keyboards that fit my criteria. These are the Arc keyboard, the Sculpt mobile keyboard and the Wedge mobile keyboard. The Arc came in just a bit larger than I liked and I really didn’t care for the key action. However, I was quite content with the Sculpt and Wedge. What ultimately ruled them out for me was that they were very Windows focused. Microsoft has thrown their entire business venture into making the new paradigm for Windows a success, and that includes their hardware. While technically compatible with the iPad, the Windows focus takes away from the attractiveness. In addition to their keyboard cases, Logitech has two keyboards that fit my selection criteria; the Bluetooth Illuminated Keyboard and the Tablet Keyboard for iPad. Both keyboards have very similar key action and layout. There are three primary differences. The first is that the Illuminated Keyboard has multiconnect capability. It can pair to three different devices. The second is that the Illuminated Keyboard is USB rechargeable while the Tablet Keyboard is AAA battery powered. Finally, there is a huge difference in price. The Illuminated Keyboard will run about $100 while the Tablet keyboard can be found for $50. Due to the similar typing experience and the much cheaper price, I went with the Logitech Tablet Keyboard for iPad. The first and most important question on any keyboard is “How does it type?” After about 3 months of use, I think I can answer that question. I am typing this review right now on this keyboard. While no rubber dome based keyboard will allow me to type as fast as my mechanical switch keyboard, I am certainly typing as fast as any other rubber dome commercial keyboard whether intended for tablet or PC. I would estimate I’m clocking in at around 50 WPM based on previous experience. That’s about right for me on a decent keyboard and far better than what I get on the typical miniaturized layout. The keys have good feeling travel, though only 2mm rather than the 4mm of my mechanical keyboard. That’s not uncommon and certainly not a detriment. In spite of the short travel, the keys have a very distinct tactile response when the key registers. Better than the Apple keyboard in my opinion. The keys also have a satisfying – albeit – quiet click to them. For me that is a definite plus. It is a very comfortable keyboard for touch typing. While the keyboard is rather flat, it does have a slight tilt, thanks to the battery compartment. Just enough for comfort, though as with all such keyboards, I would have liked a bit more. The keys themselves also have just a bit of curvature to the surface. It’s very hard to see, but the fingers certainly know it is there. This is a very subtle but important assist in touch typing. One of the reasons for my pickiness about keyboards is that I’ve had some history of repetitive strain issues. Keyboards have played a big role and I’ve found that the quickest way for me to get aching wrist is to type on a poor keyboard for an extended period. Ergonomic design has certainly helped, but I’ve found the most effective solution has been in the keyboard action. I can type on the Tablet keyboard for a few hours at a time with periodic short breaks. Even though the travel is only 2mm, I still don’t get the feel of hard impact and bottoming out that I do on most non-mechanical switched keyboards. The only other such keyboard I’ve been able to say this about has been the Apple. Physically the keyboard measures 11.3″ by 5.12″ and is 0.62″ thick. It weigh just over 14 oz. It is powered by four (yes, four) AAA batteries, which come with the keyboard and account for much of the weight. I cannot comment on battery life, because after three months, I’m still on the original batteries. Draw your own conclusions. The most obvious difference from a desktop keyboard is that there is not a Function Key row. Since this keyboard is intended for the iPad, that is something that will not be missed. The power switch is on the top right, as are the battery and connection lights. These lights show at power-on for a few moments, then go off for regular use. The switch is a two position slide switch that is slightly recessed. It is easy to use and will not switch on or off by accident. There is also an indicator light for the Caps Lock key. On the bottom of the battery compartment is the pairing button. This switch is small and recessed to prevent accidental triggering. It is also elongated, so a fingernail is sufficient to press it. You won’t need a pen or bent paperclip. By way of physical construction, the keyboard is a very rigid plastic. It has a very weighty and solid feel. For those who like to tout the Apple’s aluminum surface, I will note first, that this is primarily cosmetic. Look underneath and you will find that it too is plastic. In spite of a composite top, the Logitech does not feel any less durable. The keyboard also comes with a case that serves a double purpose that I’ll discuss later. In its case, they keyboard just barely fits my small profile iPad case. Out of the case, it fits snugly but easily. Looking at the keyboard itself, there is clearly space between the keys. Holding this keyboard against my Model M though, one finds that the key tops are very much in line with each other. This works well with the physical key design to give such a good typing experience. The cursor key array is below the right shift key. These keys are miniaturized to take advantage of the space available. In use, I have found that this does not create any difficulties when navigating a document. As far as special function keys, the keyboard sports typical Mac Ctrl, Option and Cmd keys. These allow for standard Mac style navigation and editing commands. These are all standard size keys. It’s also worth noting that the Ctrl key is only on the left side (more on that later). Below the left shift key, there is also a function key. This key is used to trigger the special functions assigned to the numeric key row. These keys provide what has become the typical media control keys, a show/hide on-screen keyboard control and slideshow control. I honestly have never understood why most keyboards have this latter. I have yet to find anyone who actually uses it. There is also support for a back-quote and tilde keystroke. Finally, the fn-Delete key combination will power off or bring up the lock screen similar to pressing the top button of the iPad. This particular two-key combination makes it useful and safe from being accidently triggered. I wish I could say the same about one of the two iPad specific keys that were included on this keyboard. Rather than having a right side Ctrl key, this key has been given the function of calling up the iPad’s search function. This is the only aspect of this keyboard that I do not like. when using keyboard navigation, it has proven far too easily to hit this search key. This has the effect of popping me out of the current program and going to the search screen. This is very annoying. I don’t use the iPad search function often, though I know some like it. On a much more positive side, there is another iPad specific key. What most keyboards would have as an Escape key is a Home key on this keyboard. This key functions the same as pressing the Home button on the iPad. That also means allowing a double press to bring up the task switching view of the springboard. This key is perfectly located and extremely useful. It doesn’t allow for the “long press” that brings up the move/delete icon function, but since that is such a screen-focus task, that is a non-issue. On final aspect of this keyboard needs to be discussed. That is the case. The Tablet Keyboard is one of the few stand-alone iPad keyboards that comes with a protective case. This case adds to the size, of course; enough so that it makes the fit in the iPad case quite tight at best. I find that even so, I prefer to bring it along. Not only does the case serve as good protection for the keyboard, it also converts to a very effective keyboard stand. This stand allows the iPad to be set in either landscape or portrait orientation with a cover still attached. The case will split apart as seen in the illustration and an extensible tab will extend to hold the iPad. It looks like it would be flimsy but in this case looks are quite deceiving. The support is quite solid and the weight of the iPad is enough to engage small profile feet to keep it from sliding around on the table. 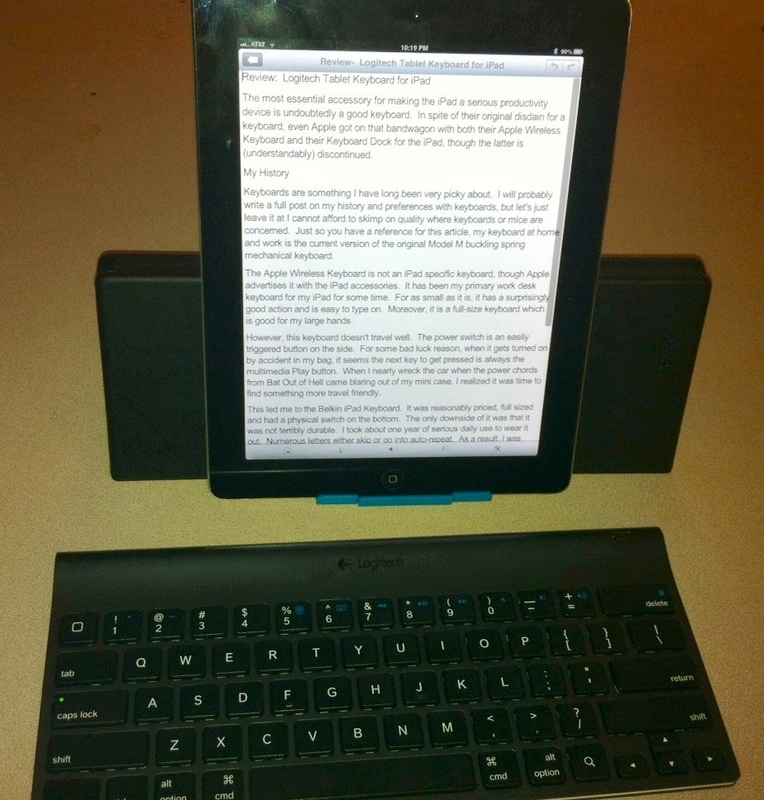 As I said, I’ve written this review on my Logitech Tablet Keyboard for iPad. This is hands-down the best iPad keyboard I have used, period. After three months of heavy use, it is still reliable and effective. No, it’s not as good as typing on my Model M mechanical keyboard, but no other keyboard is that good, in my opinion, even for a full-size PC. Still, this keyboard types better than any laptop keyboard and even most modern PC keyboards. Other than the poor position of the Search key, there is little that you can say that is bad about this keyboard. I can recommend the Logitech Tablet Keyboard for iPad without hesitation. Ok, first of all, a few corrections need to be made with regards to the success of MS Office. It’s success had nothing to do with price. It had everything to do with the failures of WordPerfect and the defeat of Lotus 1-2-3. Though MS Word was one of the oldest word processors on the market (I came across my 1983 Word 1.0 floppies a few weeks ago) it was WordPefect that had become the behemoth standard for word processing after WordStar. Mostly due to things like no more “dot codes,” print preview, reveal codes, that wonderful empty screen and legendary tech support. By the late 80’s the WP 4/5 file format had become the standard in healthcare, medical devices/pharma, defense and most important, government regulatory agencies. Sure, you could use other processors, but export compatibility with WordPerfect was essential.